Former broadcasting executive Brian Barwick is to chair Liverpool's bid to host the Commonwealth Games. The 62-year-old Liverpudlian, a former chief executive of the Football Association, has previously been head of BBC Sport and controller of ITV Sport. He will now spearhead Team Liverpool, the city's drive to secure the event in 2026, or 2022 should the UK host the Commonwealth Games following Durban's recent withdrawal. He said: "Having worked in and around sport most of my adult life, the chance to lead the work for my home city of Liverpool to host the Commonwealth Games is a huge privilege. I am delighted to be involved in this project and clear that Liverpool, with such an illustrious sports history, will make the perfect host city for the Commonwealth Games. "I have already spent some time with the team and am very impressed with their enthusiasm and expertise." Liverpool mayor Joe Anderson added: "I am delighted that Brian Barwick has accepted my invitation to chair the city's bid to host the Commonwealth Games. 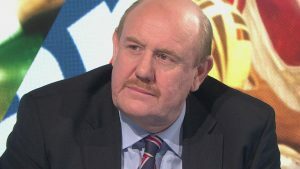 He brings a wealth of experience both as a leader of some of the biggest sports organisations in the country and a successful career at the highest level in TV sport." Dr Denise Barrett-Baxendale, a director at Everton FC, will take on the role of deputy chairman of Liverpool's bid. Marketing agencies Vero Communications (PR and communications) and Brand Oath (bid brand) have also been appointed. Liverpool City Council said that up to six months would now be spent on putting together the strongest possible case, with a budget of £500,000.